Amal Clooney seeks meeting with Egypt’s president over jailed journalist. Lawyer Amal Alamuddin on Oct. 14, 2014, in Athens, Greece. Human rights lawyer Amal Clooney is seeking a sit-down with Egypt’s president and foreign minister to press for the release of Al Jazeera reporter Mohamed Fahmy. When Australian reporter Peter Greste was deported on Feb. 1, an official had said Fahmy’s release would be imminent but that has yet to happen. Al Jazeera news channel’s Mohamed Fadel Fahmy listens to the verdict inside the defendants cage during his trial for allegedly supporting the Muslim Brotherhood on June 23, 2014, at the police institute near Cairo’s Tora prison. Fahmy, who was sentenced to seven years in prison, agreed to drop his Egyptian nationality and only keep his Canadian citizenship in order to make deportation easier, notes Daily News Egypt. 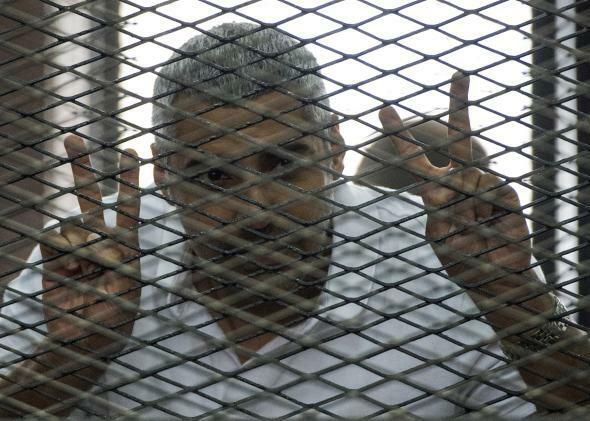 Any hope of a quick release though were dashed Sunday with news that a retrial for Fahmy and another Al Jazeera journalist jailed in Egypt will begin on Thursday. “The trial date on Feb. 12 represents our worst nightmare, to have to go through another circus of a retrial,” the Fahmy family said in a statement, according to the CBC.